It's that time of year when most companies are firming up their PR and marketing budgets and plans for 2011. Many organizations are budgeting and planning to enter any number of business awards competitions in the new year, because they know that awards are cost-effective tools for a variety of purposes, with brand building and employee relations chief among them. But here are the three reasons why you and your organization won't win a single award in 2011 - plus the #1 reason it won't matter a whit even if you do. On occasion when I suggest to someone that they should nominate their organization in one of the Stevie Awards competitions, their response is: We don't believe in nominating ourselves for awards. We plan to do such great work that awards will just be given to us. Really? I want to reply. Which award are you hoping will make a beeline to your door? A Nobel Prize? A MacArthur Genius Award? Get real. Hope is not a strategy. If you don't believe that winning awards can help to burnish your organization's reputation, provide a low-cost reward to your employees for their good work, and provide one more incentive to your executives and workers to excel, I could persuade you otherwise, but at least that's your opinion. But if you do believe that winning awards can offer these benefits, why on earth wouldn't you plan to pursue them? Sure, it can take hours to prepare entries, and entry fees for a few awards programs can run to several thousand dollars, but the work and the cost are minor compared to the benefits of winning - and leveraging - a prestigious award. 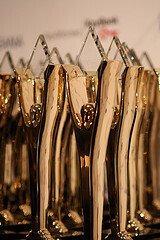 While we think our Stevie Awards competitions are the best there are, we acknowledge there are many awards programs worthy of your attention around the world for corporate awards, PR awards, marketing awards, IT awards, web awards, HR awards, and so on. Picking those that are right for you and your organization is important. And picking the categories within those competitions is also key. When someone calls the Stevie Awards to enquire about whether their organization might be a fit for one of our competitions, we ask them two questions: one, what do you want to be recognized for? And two, is it important to you in which category you might be honored? Their answer to the first question is important, because that will tell us which competition, and which category(s), will be a fit for them. The answer to the second question is also pivotal, because that will tell us whether we should recommend only the most popular (i.e. "prestigious") categories or can recommend secondary categories to them as well. It's my experience that most organizations aren't very good at formally summarizing and articulating their achievements in an engaging way. Storytelling is a vital part of corporate - and career - success. When someone says to me, I'm not sure we're ready to enter the Stevie Awards, I don't know that we've achieved enough yet, I ask them to give me their elevator speech, their one-minute summary of what they do and what they've achieved. Without fail their elevator speech is captivating. It seems that most people have honed their ability to put into a few words the essence of their capabilities and achievements. But few people can translate that pride and excitement into a longer document that's well written, well structured, and supported with examples, work samples, and the like. Until the day when we can transmit our thoughts to one another via telepathy, the written word will continue to be the way to communicate data-intensive information. So if you can't write well, you don't stand much chance of winning many if any awards. If you don't write well, hire or contract with someone who does to write your awards entries for you. * Using the resources provided by awards organizers, such as winners' logos, to create a long-term association between your products and your brand and their mark of excellence.